Waterford FRS are key dealers for GEA Farm Technologies & Westfalia Surge, Europe's leading dairy equipment manufacturer, in the south-east. GEA Farm Technologies encompasses well-known brands such as Westfalia Surge, Agroserve & Royal De Boer offering a total solutions package. GEA FT is one of the world's leading manufacturers of technical innovations, integrated product solutions, and effective animal hygiene products for cost efficient milk production. 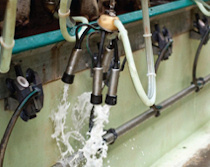 WestfaliaSurge has been developing and manufacturing milking equipment for over 100 years, and is renowned worldwide for the quality and reliability of their products. They are at the forefront of milking expertise, and at Waterford FRS we ensure that our engineers and sales consultants keep abreast of innovations to enable our customers to benefit from the latest technology. Van sales supplying chemicals, sundries and spare parts and expertise in dairy hygiene. available. Serving Irish dairy farmers for the past 40 years ensuring the highest milk quality. Ensuring low TBC is one of our priorities, with the correct wash routine these results are more achievable than you think. Morning : Hot detergent wash, circulate for 8-10mins, above 54°. Evening : Acid wash with a detergent blend to ensure both organic & inorganic material has been removed. Costs of clinical mastitis €56 / per incident. How? Stop the spread of infection : pre dip/spray and dry wipe, wear gloves and spray gloves regularly, disinfect clusters between milking's, post dip/spray. Post : Ioguard, Hexaguard, LuxDip 50B, SensoSpray 50, SensoDip 50. Unique anti-syphon valve stops water / chemical mix getting into milk-lines. Unique versions for Swingover, high-level, low-level, double-up & rotary parlour.